Universal Productions, Inc., 1936. Directed by James Whale. Camera: John J. Mescall. With Irene Dunne, Allan Jones, Charles Winninger, Paul Robeson, Helen Morgan, Helen Westley, Queenie Smith, Donald Cook, Hattie McDaniel, Charles Middleton, J. Farrell MacDonald, Eddie "Rochester" Anderson, Flora Finch. 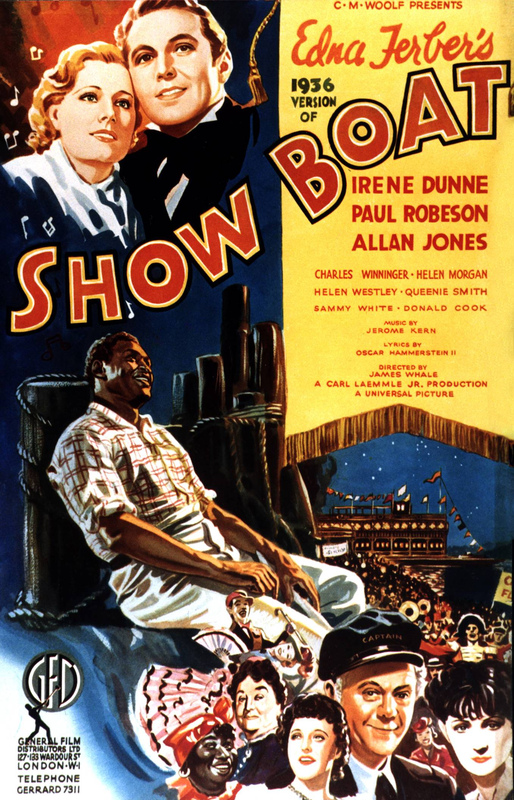 Show Boat (Universal, 1936), directed by James Whale, from the novel by Edna Ferber, is the second of three screen adaptations based on the highly successful 1927 Broadway musical of that same name. It is in many ways the finest and best adaptation ever transferred from stage to screen, in spite of numerous alterations in both story, songs and character development. First filmed as a part talkie by Universal in 1929 starring Laura La Plante and Joseph Schildkraut, and most famously remade by MGM in 1951 with Kathryn Grayson and Howard Keel, no three versions are exactly alike. What makes this particular version so special and satisfying is the casting, especially Charles Winninger, Paul Robeson and Helen Morgan, whose performances nearly outshine the leading players, all reprising the roles they made famous on the stage, whether from the original Florenz Ziegfeld production or latter revivals. Irene Dunne, who recently scored so well in an earlier musical Roberta (RKO, 1935), is back on deck singing in the best Hollywood tradition the melodies composed by Jerome Kern, whose score was also provided for Roberta. Dunne, already in her mid thirties by the time production began, is offered a difficult task in her portrayal as Magnolia Hawks, from a sprightly teenager to a mature married woman and mother, and then, before the fadeout, a middle-aged gray-haired grand dame, but without the added wrinkles, and believable in assuming the same character three different ways. 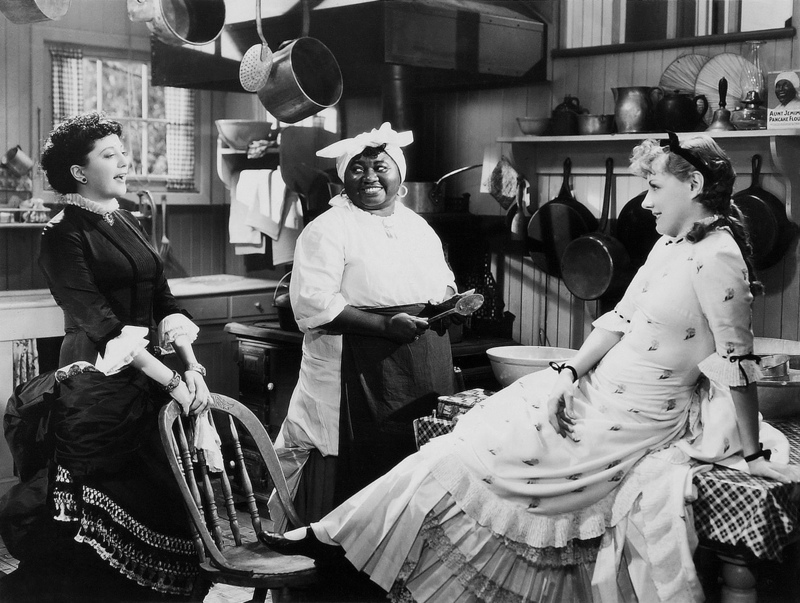 However, Show Boat isn't devoted entirely around Dunne's character, in spite of her being the leading lady, but the characters participating in the Show Boat who add to the flavor of the story. More importantly, in this version, the way the musical interludes offer the build up to a carefully constructed story. As with the first incarnation and its latter Technicolor remake, the story, set around the turn of the century, focusing on Captain Andy Hawks (Charles Winninger), of the Mississippi show boat, whose young daughter, Magnolia (Irene Dunne), meets and marrying the dashing Gaylord Ravenal (Allan Jones), with a weakness for gambling which causes their marriage to eventually break apart, especially following the birth of their daughter, Kim, remains basically the same, as does the subplot involving Julie (Helen Morgan), the daughter of an interracial couple making her an outcast to society, who loses both the lead in the show due to gossip and then abandoned by her husband, Steve, a white man (Donald Cook), and how fate steps in as Julie sacrifices her own happiness in order for Magnolia to obtain hers, even from a distance, and never letting her know of her kindness that goes unnoticed to Magnolia, but not to its viewers. The large supporting cast consists of Helen Westley as the overbearing Parthy Hawks, a role originated on stage by Edna May Oliver; Sammy White as Frank Schultz and Queenie Smith as Ellie Mae Shipley as the comedy team acting couple; J. Farrell MacDonald as Captain Windy MacLane; Francis X. Mahoney as Rubberface Smith; Sunnie O'Dea as the young adult Kim; Marilyn Knowlden as the adolescent Kim; and familiar faces of character actors appearing in minor roles, including Arthur Hohl, Charles Middleton, Stanley Fields, Charles C. Wilson, Arthur Housman (as a drunk), Bobs Watson, Harry Barris, among others. Songs, great songs, immortal songs, most from the Broadway show, three newly written for the screen, composed by Oscar Hammerstein II and Jerome Kern supplying numerous highlights to Show Boat, an added plus to this screen version, performed the order in which they appear, include: "Cotton Blossom" (sung by chorus); "Where's the Mate for Me" (sung by Allan Jones); "Make Believe" (sung by Allan Jones and Irene Dunne); "Ol' Man River" (sung by Paul Robeson)'; "Can't Help Lovin' Dat Man" (sung by Helen Morgan, Hattie McDaniel, Paul Robeson and Irene Dunne); "I Have the Room Above Her" (new song sung by Allan Jones and Irene Dunne); "Gallivantin' Around" (sung by Irene Dunne playing the banjo in blackface); "You Are Love" (sung by Jones and Dunne); "Ah, Still Suits Me" (new song sung by Paul Robeson and Hattie McDaniel); "Make Believe" (sung by Allan Jones); "Bill" (sung by Helen Morgan); "Can't Help Lovin' Dat Man" (sung by Irene Dunne); "Goodbye, Ma Lady Love" (sung by Sammy White and Queenie Smith); "After the Ball" (by Charles Harris/sung by Irene Dunne); Instrumental dance number (performed by Sunnie O'Dea); "You Are Love" (sung by Dunne and Jones) and "Ol' Man River" (sung by Robeson/closing scene/ fadeout). Allan Jones, then on loan from MGM following his initial co-starring role opposite The Marx Brothers in A Night at the Opera (1935), makes a fine choice as Dunne's leading man. (Had this movie been done some years earlier, chances are the selection of Gaylord Ravenal might have been played by John Boles). Aside from playing a husband who abandons his wife and child, he convincingly acts out his character as not a bad guy but a weakling who can't control himself from gambling and going heavily into debt. Other than that, his gentleness in his voice, especially when vocalizing, adds to the likeable appeal to his character. What a pity Jones never became a major singing actor of movie musicals as the more legendary names of Bing Crosby or Frank Sinatra had accomplished in their careers. As with many stage to screen musical transfers, some tunes are omitted ("Life Upon the Wicked Stage" and "Why Do I Love You?" have survived through underscoring), and/or substituted with newer ones, such as the case for this Show Boat. The movie is not all musical, in spite of a handful of songs selected for the 1936 treatment, but comedy acts and a sort of "East Lynne" dramatic skit involving Magnolia, Frank Schultz playing the villain, and Gaylord Ravenal acting the handsome hero Hamilton Brown, inserted as part of Captain Andy's Show Boat attraction. Aside from show performances that appear to be historically accurate in terms of the era it is set, what director James Whale does with Show Boat is present several show-stoppers during its opening twenty-five minutes of screen time rather than using them during its traditional final half hour. And what an opening it is, from the Jones and Dunne "Romeo and Juliet" balcony-style duet of "Make Believe," to Helen Morgan's delightful rendition of "Can't Help Lovin' Dat Man," to Paul Robeson's powerful baritone treatment of "Ol' Man River." 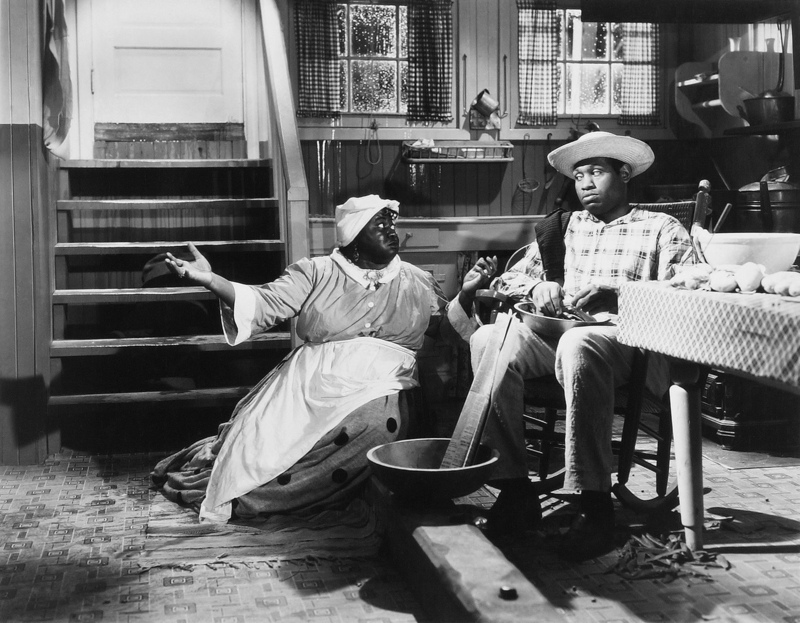 For the latter, instead of focusing solely on the singer for about three to five minutes, the camera first circles around the sitting Robeson from his back before returning to his full face, followed by a montage of scenes involving Robeson's character and others as they carry out their story by lifting bales, getting drunk and landing in jail. Unlike the MGM remake, by which the score is orchestrated with a slow tempo, including the haunting melody of "Ol' Man River" which is sung in a slower but soothing manner, to the half spoken/ half singing of "Bill", the song numbers for this Show Boat are entirely satisfying, playing at a livelier upper beat, making this more catchy and pleasing to the ear. But what the Whale version doesn't have, that became an asset to the 1951 remake, is Technicolor. As mentioned before, camera shots from various angles are an important factor to this production, especially close-up profiles rather than the traditional full face shots, on Allan Jones and Irene Dunne, adding a then new style to movie making, compliments of James Whale's direction. The final half hour of Show Boat follows the pattern of "passage through time" stories that became quite common place in films of the 1930s, borrowing from Edna Ferber's own Cimarron, which got the screen treatment and an Academy Award in 1931 also featuring Irene Dunne, whose character and others in the story age through the years. Whale abandons the Mississippi/Show Boat theme during its final minutes by shifting the story to modern day Chicago where the Magnolia child, Kim, now a young woman, is seen performing in the theater, making this segment appear like another movie. On a personal note, had Whale only concluded this story the way MGM had done years later, would have made a much more satisfying conclusion, and possibly Helen Morgan an Academy Award nomination as best supporting actress. But in typical Hollywood fashion, decisions on suitable endings always did lead to complications, such as this case, but the movie itself is still an outstanding achievement in movie musical history, depicting realistically the joys and sorrows into the life of Captain Andy's show boat troupe and family during its 114 minutes of screen time. James Whale successfully manages to keep this Show Boat afloat. 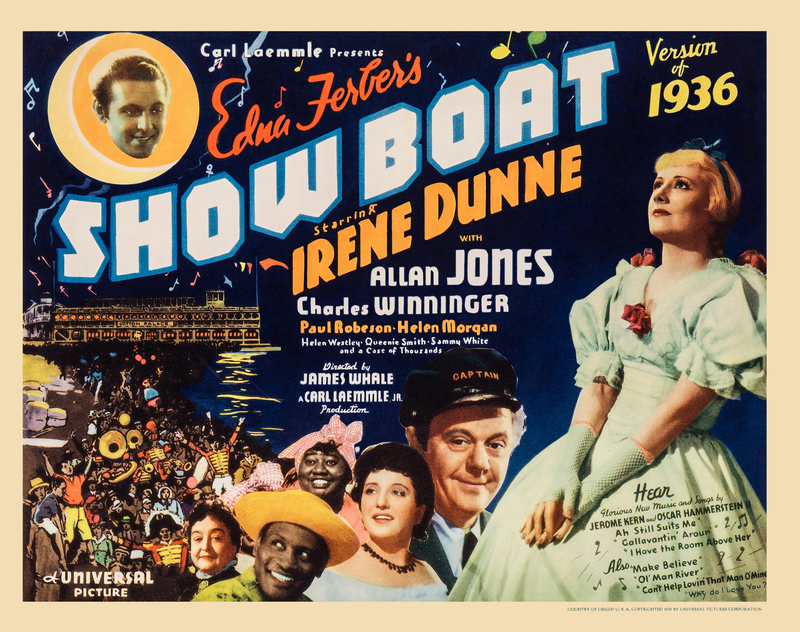 As popular as this version of Show Boat was and has become over the years, through its revivals on either a local public television channel or Turner Classic Movies, it's hard to imagine that this 1936 version was at one time a movie destined never to be seen or heard from again. 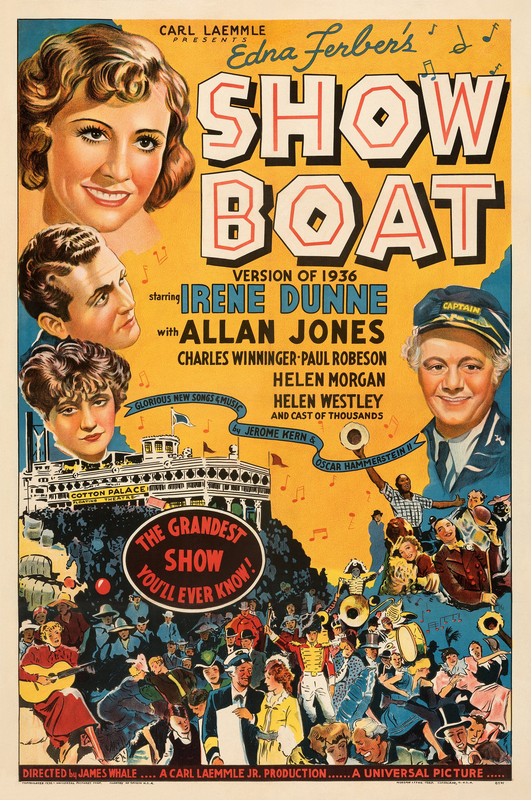 As TCM host Robert Osborne once pointed out in one of his profiles about the movie is that MGM acquired the full rights to Show Boat some time after Universal's 1936 remake. 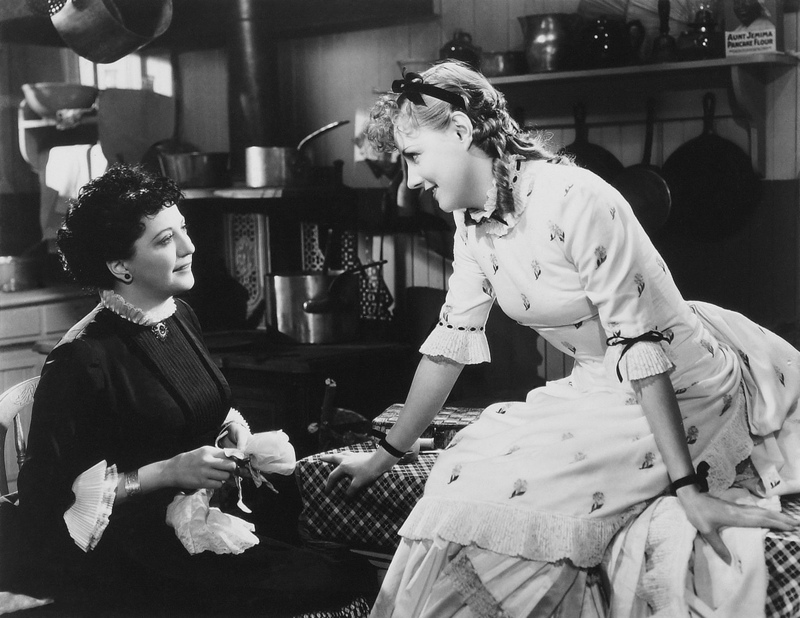 While plans were considered to remake Show Boat, MGM style, during the 1940s, at one point starring the popular team of Jeanette MacDonald and Nelson Eddy, it finally made it to the screen a third time in 1951. Because of the remake, MGM kept all earlier versions to Show Boat out of circulation. Rumor had it that all negatives were destroyed so no comparison could be made. Thank goodness prints have survived, but having Show Boat brought back in circulation became a slow process. 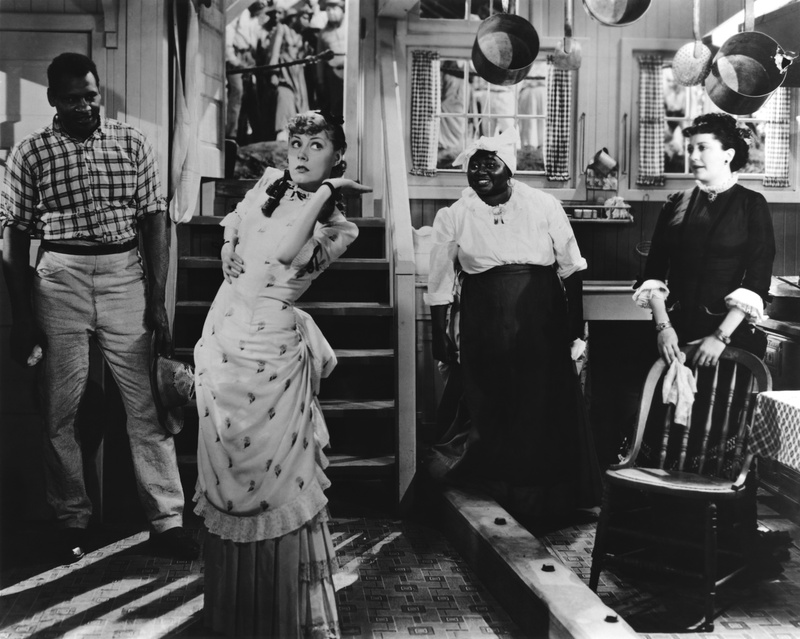 It did get revived in old movie houses in the 1970s, and a decade later, made it at long last to numerous public television stations in various states around 1985, and later its distribution on video cassette, assuring the Show Boat's melody will forever linger on.